It's that time of year again. You send an email hoping to get something done and ping - it comes straight back to you with an out-of-office response. It's annoying because it means you have to email someone else, but also because it's a reminder that you're stuck in the office working while others are off having fun. For many people setting an out-of-office (OOO) response is a last-minute chore, the final obstacle standing between them and their holiday. But for some it has become a labour of love, a way to show off their sense of humour or tell everyone just how much fun they are having. Here are some of the best examples showing the potential of the humble out-of-office reply to become, well, something so much more. "I'm off with my family right now, back on 23 July. I'll be reading, diving and playing with my boys while they still want to play with me! Frankly it seems a bit smug. I'd like to spend time with my children too, but I'm stuck at work. But Ms Romanovitch - who is indeed out of the office so unable to speak to me in person - says via email that the point of her unusually detailed OOO is to let everyone know that it is ok to switch off. "There is still so much that creates a sense of needing to work 24/7. "My out-of-office is just one of those little things I do to signpost what I think should be the norm," she says. Tyler Brûlé, the editor-in-chief of the magazine Monocle, declined to speak to me for this article. But he has written an entire column for The Financial Times on why everyone, particularly those at the top, should say a big fat no to the OOO. He argues they are "out of step with the ways of the modern world" and suggests people who use them simply aren't committed enough. And if you thought the classic "limited access to email" was a good OOO excuse, Mr Brûlé says that unless you work "200ft below the streets of New York repairing the sewers" everyone will know you're telling fibs. Image caption Would you use your out-of-office to channel your inner Rick Astley? Such concerns haven't hindered Steven Nelson, a veteran writer of elaborate out-of-office responses. One of his most memorable OOOs was written in tune to eighties pop star Rick Astley's hit Never Gonna Give You Up. "Never gonna give you up, Never gonna let you down, Never gonna run around and desert you, Never gonna make you cry, Never gonna say goodbye, Never gonna tell a lie and hurt you. "I'm also never gonna reply to your message until 9th August as I'm off on holiday." Mr Nelson, from the financial services consultancy The Lang Cat, admits he's now cringing with embarrassment about his message, but it hasn't stopped him writing them. In fact, he's now in fierce competition with a fellow out-of-office joker at the firm to try to outwit one another. "It's got to the point where I feel an inordinate amount of pressure to come up with one," he admits. His jokey response was prompted by an urge to counteract all the serious "self-important" OOOs he received, telling people who to contact if their enquiry was "urgent". "We work in financial services. What could possibly be classed as urgent?" he says. But not everyone gets to find out how funny he is, as his most humorous responses are set to reply to internal emails only. "It's a really fine line, you don't want to make your organisation look like a fun factory," he says. Edwyn McFarlane, a business innovation director at Awin - a firm that helps websites make money from referrals - also isn't brave enough to send his OOO response externally. But he says for junior staff members, who deal with clients they know, a funny out-of-office can "be a good marketing tool". "I am on annual leave until dd/mm/yyyy. I will allow each sender one email and if you send me multiple emails, I will randomly delete your emails until there is only one remaining. Choose wisely. Please note that you have already sent me one email." Disappointingly, he says it is definitely a joke and he never actually deletes any unread emails. Some firms, however, actively encourage it. In 2014, German car firm Daimler set up an optional service for workers going on holiday to have all new emails automatically deleted. France has gone even further by giving staff the legal right to "disconnect" and avoid work emails outside working hours. Such moves aren't purely altruistic. Compulsive out-of-hours email checking and the inability to switch off has been blamed for everything from burnout to sleeplessness as well as relationship problems. In Volkswagen's case it said research showed that staff who switched off properly performed better in the longer term. Interestingly, recipients of such emails say they don't find them offensive, perhaps wishing they had been told to do the same. BBC journalist Bill Thompson says he admires "the honesty" of such OOOs. Barbara Pachter, the author of The Essentials of Business Etiquette, says an out-of-office response is often the first impression someone in your professional life gets of you. Her advice is to keep it simple, warning that joking around or "giving too much personal information" is liable to annoy many recipients. One plus of being a bit more daring in your OOO reply is that it can soften the miserable feeling of having to get back to work after a week or two of fun. Rob Gilroy, a copywriter, who initially wrote funny out-of-office answers to amuse himself, says he now looks forward to his return just to read the replies. "ERROR 405: Could not reach copywriter. Soz. Haha! What a brilliantly geeky joke, that. But in all seriousness, if you're wanting something done, no can do. 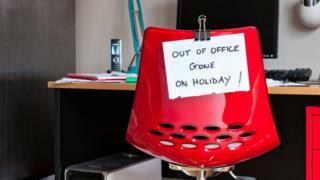 "I'm out of the office from now (Tues 27th June) to until then (Friday 30th June). "And if you're that Nigerian Prince, asking for more money, then no. Not until you've paid that £12,000 back into my account. "Other than that? I'll bring any and all answers on my return. Peace out." Mr Gilroy admits not everyone will get it: "I imagine there's a healthy dose of people who find them twee or annoying." That of course is the risk. But in terms of getting it wrong it's unlikely anything will rival the out-of-office that ended up on a road sign because officials assumed the auto-reply was the Welsh translation that they had requested. As a result, a sign meant to bar lorries from a road near a supermarket instead read in Welsh: "I am not in the office at the moment. Send any work to be translated." An embarrassing error, but quite fun. And after all, if no-one wrote amusing OOOs then us poor people left stuck in the office over the summer would have even less fun.